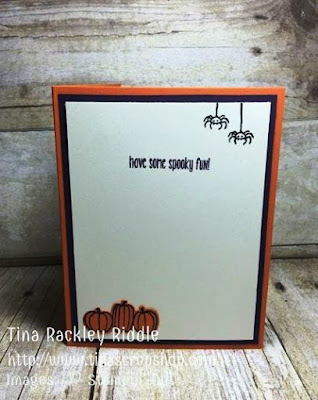 Tina's Crop Shop: OSAT Blog Hop - Oh My Pumpkins and Pie! OSAT Blog Hop - Oh My Pumpkins and Pie! Hello and Welcome to One Stamp At A Time's Oh My Pumpkins and Pie Blog Hop! 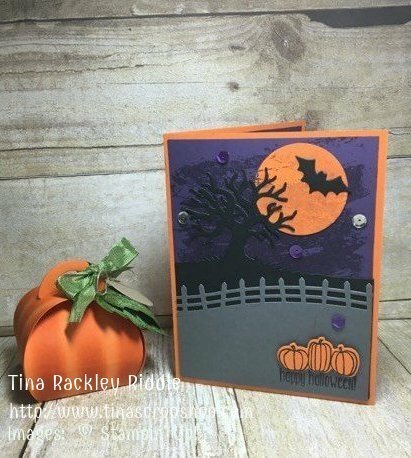 This month it is all about Pumpkins, Fall or Halloween cards and projects! If you have already been hopping you should have landed here from the Fabulous Maria Willis' blog! Isn't Maria amazing?? If you started with me, please make sure to continue on to all of the blogs as there is a lot of awesome inspiration for you this month!!! 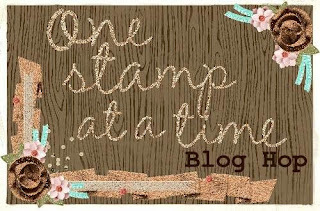 I was super excited to get my new Stampin' Up! Spooky Fun stamp set and coordinating Halloween Scenes Edgelits Dies to use on this card! For my card, I went with traditional (to me) Halloween colors... Pumpkin Pie, Elegant Eggplant, Basic Black and Basic Gray. My cardbase is an 8 1/2" x 5 1/2" piece of Pumpkin Pie cardstock scored at 4 1/4" for a standard A2 Card Base. The next layer is a 5 1/4" x 4" piece of Elegant Eggplant that had been stamped in Elegant Eggplant Ink with the Watercolor Wash background stamp. I punched out a circle in Pumpkin Pie for the moon and stamped it with the 2nd generation of the Elegant Eggplant Watercolor Wash stamp. I adhered that to the Purple layer in the upper right section. The next layer is Basic Black that was also 5 1/4" x 4" and was cut with the Tree scene die and adhered with Fast Fuse over the purple so that some of the branches are in the moon. I die cut a bat out of a scrap of basic black and added that over the moon as well. Next up is the fence scene that was cut out from a 4" x 4" wide scrap of Basic Gray Cardstock. 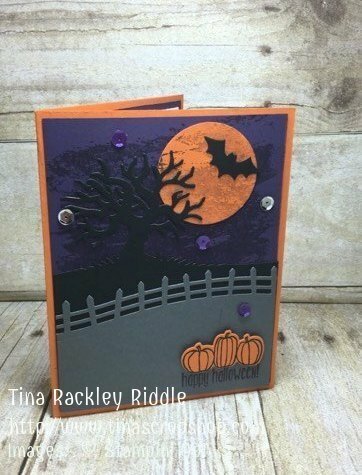 The Happy Halloween sentiment was stamped on it in Elegant Eggplant on the bottom right before adhering this to the card front. I stamped the pumpkins in Basic Black Archival Ink onto Pumpkin Pie Cardstock and die cut them with the dies from the Halloween Scenes Edgelits Dies. I adhered them with Dimensionals right over the sentiment. Last but never least, I added some Pretty Pink Posh Purple and Silver Sequins from the Enchanted Garden Mix. I bought these from Justin Krieger at his Stamp, Ink, Paper Store! I LOVE these colors in this mix! The inside of my card had a 4 x 5 1/4" piece of Elegant Eggplant Cardstock as well as a 3 3/4" x 5" piece of Very Vanilla Cardstock. The spiders were stamped in Basic Black Archival Ink in the upper right corner. The sentiment was stamped in Elegant Eggplant Ink. Finally, some die cut pumpkins done the same as the ones on the front of the card were added in the lower left side. 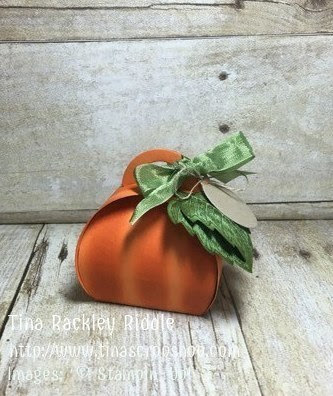 The Pumpkin Curvy Keepsake Box was cut from Pumpkin Pie Cardstock and striped with a sponge dauber in Pumpkin Pie Ink. The Leaves are stamped Tone-on-Tone on Old Olive Cardstock with the Vintage Leaves Stamp set and cut out with the Leaflet Framelits Dies. They were adhered with Tombo Multipurpose Glue. I tied a bow with some Green Seam Binding. The tag also from the Curvy Keepsake Framelits was cut out in a scrap of Sahara Sand and tied on with Linen Thread. This pumpkin turned out super cute and I think it would make an awesome place setting or treat box! Thanks so much for stopping by! To continue just click the Next button for some wonderful inspiration from the awesome blog of Renee Romain Ondrajka! Here is a list of all of our Bloggers just in case you've lost your way! Tina Rackley Riddle -That's Me!!! PCC215 Fall into Fall with Acorny Thank You! SIP Challenge #69 - Love!